- Atlantic Loyalist Connections: Who was Nehemiah Beckwith? + Response re Oath to ... Christianity? With the official passing of summer, let's take a moment to join L. M. Montgomery in declaring, "I'm so glad I live in a world where there are Octobers." As a new school term begins, we are reminded of the value of UELAC scholarship and the opportunity it provides to promote and preserve Loyalist history. In 2018 UELAC supported three postgraduate students. This is the final year of scholarship support for Stephanie Seal Walters of Fairfax, Virginia and newly graduated Dr. Sophie H. Jones of Liverpool, UK. We look forward to adding their successful dissertations to the UELAC resource library and to the Loyalist Collection at Brock University. In March, we welcomed a new UE scholar – Kelly A. Grant, a PhD candidate at Concordia University, Montreal. For those who subscribe to the Loyalist Gazette please watch for a feature article written by Kelly in the upcoming November issue. As of September 2018, the new total in scholarship has risen to $7,528.00. Thank you for your continued support. Please remember, donations to the Loyalist Scholarship or the Scholarship Endowment Fund are welcome throughout the year. Should you wish to make a memorial gift we will ensure that recognition is given to those you wish to honour through your donation. With great pleasure we welcome Christine Manzer UE to the UELAC Scholarship committee. Christine is the 1st VP of the Vancouver Branch of the UELAC. She retired in July 2017 after 33 years in the Simon Fraser University Library where she developed a keen interest in the unique tools and resources needed by graduate and post-graduate researchers. Christine follows many history department Twitter accounts from Canadian Universities and believes strongly in the role of public historians who often work outside of academic settings. She considers her life's goal to be that of encouraging young people in their academic work and looks forward to being useful on the UELAC Scholarship Committee. Christine's Loyalists are John Manzer and Daniel Parent who settled in New Brunswick. Peter Moogk, UE, Vancouver; Murray Barkley, UE, St. Lawrence; Taylor Stoermer, Johns Hopkins University; Tim Compeau, Western University; Christine Manzer, UE, Vancouver; and Bonnie Schepers, UE, Chair. Sincere thanks to these outstanding volunteers and to the UELAC members and financial supporters of the Loyalist Scholarship program. Please note, the deadline for scholarship applications for 2019 is February 28. While they did not face the same degree of violence as men, Loyalist women suffered alongside their fathers, husbands, brothers and sons – and experienced their own particular forms of aggression and isolation. Once their political views were known, ordinary life for Loyalist women during – and after – the revolution would never be the same. The ties that bound them to other women in their communities would be irrevocably sundered. Loyalist men endured physical abuse, the loss of property, imprisonment, loss of status, and divided families. While loyalist women were not usually subjected to the same violence as men, Sarah Slocum's story is evidence that gender alone did not protect one from rebel persecutions. Rhode Island patriots cut off Slocum's earlobes and branded her cheeks. A female mob in Boston tarred and feathered the wife and daughter of a man who joined the British army; the mother of a newborn barely escaped the same fate at the hands of 200 New England women. However, the abuse Loyalist women suffered at the hands of Patriot women usually left psychological rather than physical scars. In her 1975 book, Founding Mothers: Women of America in the Revolutionary Era, Linda Grant DePauw outlines the various political activities of women who supported the Patriot cause. In doing so, she provides context for the everyday lives of Loyalist women – women who would eventually be cut off from the life of their communities. Female relationships held colonial communities together. Women worked with one another to feed and clothe their families. They were midwives, mourners, and companions for one another, gaining strength from each other's company and counsel. Survival was a shared objective. Except for well-to-do women on plantations or in urban settings, the average American woman was constantly at work, tending crops, feeding her family, spinning yarn, knitting and sewing. The drudgery of life was made easier by the fact that women could socialize in one other another's homes as they worked on producing clothing for their families. As fingers rapidly hemmed shirts, embroidered pillowcases or pieced quilts, the gathered women could share news, offer advice, and share their hopes for the future while their men went about their business outside the home. These sewing bees would be have been the only opportunities that colonial women had to enjoy the life sustaining female friendships that kept them – and by extension, their communities – together. The American Revolution tore apart this social fabric that had been formed by female relationships. The women's clubs and "circles" that had started out as opportunities for shared handiwork, conversation and fellowship became focal points for promoting the politics of rebellion as early as 1766. Spinning and politics in the American colonies were as strongly intertwined as any strands of yarn produced on a spinning wheel. Clothing manufacture was Britain's most important industry and therefore, the production of fabric and finished apparel was forbidden in the colonies. When Patriots began their boycotts of British goods in retaliation for what they perceived as unfair taxes, the grassroots of the economic protest could be found in the spinning circles of colonial America. By making their own cloth, sewing their own clothes, and knitting their own socks, colonial women were taking profits from the textile manufacturers of Britain. As DePauw points out, the Patriot women of America "clearly viewed their spinning wheels as weapons". In addition to boycotting British textiles, women pledged to stop buying luxury items from Britain – as well as something that they considered a near necessity: tea. It was women who bought groceries for the home, and so the tea boycott was very much a female form of protest. Newspapers carried stories of women's societies that vowed to give up tea until the tax was removed – and they actively encouraged other women to do the same. In October of 1774, fifty-one women gathered at the same time as the First Continental Congress where they voted to give up the "Pernicious Custom of Drinking Tea" and also not to "promote the wear of any manufacture from England until such time that all Acts which ten to Enslave this our native Country shall be repealed". After independence was declared, patriot women knit stockings for Continental soldiers, sewed army uniforms, and used their kitchens to make saltpeter, a substance essential in making gunpowder. One women's group produced 42,088 cartridges for rebel muskets. Female prodding had much to do with increasing the enlistment of rebel soldiers. The largest Patriot women's organization, formed in 1780, was known as simply the "Association". It raised funds to buy special "gifts of gratitude" for rebel soldiers. Donations were collected in country churches or by door-to-door canvassing in the larger towns. In the end, the funds paid for the creation of 2,200 hand-made shirts, each one bearing the name of the woman who made it. Imagine, then, what it must have been like to be a Loyalist woman in such a politically charged environment. The sewing circles of old had become support groups for the rebelling colonies. No longer could a loyal woman confide in her friends or seek solace from a sympathetic ear. Any luxury purchase that she made would be seen as a traitorous action. Drinking tea was a political act of defiance against the Patriot cause. Having one's sons and husband at home was suspicious; having them go off to join a loyalist militia was sure to bring down the wrath of the local rebel committee. The only known association of loyalist women was a group based in New York City that raised funds in 1779 to buy a sailing ship. Christened The Fair American, it was purchased to wage war as a privateer – a legally sanctioned pirate ship. The city's loyalist newspaper, the Royal Gazette, noted the ship's purchase "reflects great credit on the patriotism of the ladies." At the end of the American Revolution, upwards of 60,000 Loyalists became refugees, bidding farewell to homes, friends and family to forge a new life in remote parts of the British Empire. However, for many of the women boarding evacuation ships or walking overland to Canada, their good-byes had been said many years earlier. With the barring of doors to homes that had once welcomed them to sewing circles and conversations over tea, Loyalist women had already parted ways with their neighbours and friends. The ties that bound women together in community had been severed, never to be restored. Rev. Ranna Cossit was the first Anglican minister to settle in Sydney, Cape Breton. He became involved in local politics and was a key player in a feud that divided the town. Unable to separate church and state, Cossit was eventually forced to leave Cape Breton. Built in 1787, Cossit House is one of the oldest surviving houses in Sydney. It was built by Anglican minister, Reverend Ranna Cossit, a loyalist from New Hampshire who settled in Sydney in 1786. When Cossit agreed to the post, the Lieutenant-Governor of Cape Breton, J.W.F. DesBarres, promised he would have a house and temporary church ready for Cossit upon his arrival. Yet when Cossit landed, house construction hadn't even begun and the church buidling had been destroyed by a wind storm. Cossit therefore spent his first year building a two-story home on Charlotte Street and at his own expense, although he was eventually reimbursed. The house had six fireplaces and plenty of room for his wife and several children, who arrived a year later. Cossit then set his sights on rebuilding the church, this time a permanent structure made of stone. Like his home, Cossit had to cover the cost of construction, as money from the British government would only be sent once the church was complete. But Cossit was resourceful and in 1791, Saint George's Church was designated an official Anglican parish. Thankful Cossit died giving birth to her thirteenth child in 1802. Her husband recorded in the register of his church that she was a woman whose "whole life was ornamental to Christianity, as a wife, a parent, and a neighbour." Atlantic Loyalist Connections: Who was Nehemiah Beckwith? A month or so ago, a reader of Atlantic Loyalist Connections commented on a blog entry I wrote about Benedict Arnold. In it, Nehemiah Beckwith (1756-1815) was identified as a shipbuilder who built the first sloop on the Saint John River for General Benedict Arnold. I thought to myself, "Hey, we have Beckwith material in the UNB Archives & Special Collections, perhaps I could write something linking up the Beckwiths to this Nehemiah!" But I was having a hard time determining Nehemiah's assumed Loyalist connections, which I found mentioned in some articles but not others. I was not finding him on any lists of New Brunswick United Empire Loyalists or in The Loyalist Collection. As it turns out, Nehemiah Beckwith was a actually a pre-Loyalist, or rather, a Planter. I first found a mention of Nehemiah's pre-Loyalist status in an entry from the UNB Archives catalogue about his descendent, Elizabeth Beckwith Hazen. It was not until I stumbled across an article by Lilian M. Beckwith Maxwell that I found the information I was looking for, although sadly she did not cite her sources. Maxwell's article, entitled "The First Canadian Born Novelist" is about Julia Catherine (Beckwith) Hart, daughter of the elusive Nehemiah Beckwith, who at the age of 17 wrote "St. Ursula's Convent or The Nun of Canada". From elementary school books to encyclopedia entries to scholarly treatises, no work on New France is complete without a section on the "seigneurial system," a phenomenon that supposedly shaped the agrarian society of this colony and set it apart from other colonial settlements. Imposed upon Canada by absolutist France, so the story goes, the system accorded various rights and obligations to seigneurs; these were counterbalanced by another set of rights and obligations granted to censitaires. Although it evolved over time, its essential nature and inner coherence lasted from 1627, when it was instituted by imperial fiat, until its "abolition" in the 1850s. Other colonies had their respective land tenure regimes, it is implied, but only New France and Lower Canada were in the grip of a "system." The "seigneurial system" has proven a very resilient abstract construct, largely unaffected by half a century of rigorous research on the part of Louise Dechêne, Sylvie Dépatie, Thomas Wien and others on the actual workings of early Canadian seigneuries in all their diversity and complexity. Drawing on earlier empirical work, chapter 5 of my recent book, Property and Dispossession, also looks at colonial land tenure comparatively. From that vantage point it challenges the still-conventional view in every particular, beginning with the notion that there was something "systematic" about New France's agrarian regime. I'd like to take this opportunity to highlight, briefly and a little polemically, the book's points of divergence with the orthodox interpretation. At nine o'clock on the morning of May 6, 1778, Continental soldiers at Valley Forge emerged from their huts to hear their regimental chaplains announce the American alliance with France. This was followed by the troops forming in ranks for a review by General George Washington, the firing of muskets by Washington's guard, a thirteen-gun artillery salute, a feu de joie fired by the whole army, and shouts of "huzza" and "Long live the King of France." This enthusiastic celebration of the new relationship with the French marked a complete reversal of American opinion: just fifteen years earlier, France had been a hated enemy. Loyalists were quick to seize upon this evident hypocrisy and use the alliance to validate their own allegiance to Britain while attempting to rekindle anti-French sentiment to undermine the revolutionary movement. Foremost in this effort was Charles Inglis in New York City, who in a series of essays compiled in the pamphlet The Letters of Papinian, used a host of arguments to persuade the revolutionaries that the alliance would prove disastrous. His work, however, had little impact, in part because his writings did not circulate widely outside British-controlled areas and also because most Americans were by then firmly committed to the cause of independence and willing to do whatever was necessary to achieve that goal. Animosity toward France had been a hallmark of colonial identity for more than a century before the Revolution began. Hostility toward Britain's longtime enemy increased during the several colonial wars, reaching a peak in the period from 1744 to 1763 when the British and colonists engaged in two wars with France: King George's War, 1744-1748, and the French and Indian War, 1754-1763. Historian Nathan O. Hatch observed that "the conflict with France gripped New England society with an overriding intensity." To the colonists, New France posed more than a military threat; a French victory would, they believed, destroy their "religion and liberties." Response: Don't hang your tri-cornered hat on those percentages. This famous quote comes from a letter Adams wrote in 1815 to Massachusetts Senator James Lloyd, saying "I should say that full one third were averse to the revolution ... An opposite third... gave themselves up to an enthusiastic gratitude to France. The middle third,... always averse to war, were rather lukewarm both to England and France;...." Truth is, Adams was not addressing America's rebellion -- he was writing about American attitudes towards the French Revolution, when Americans grappled with either supporting France or maintaining commercial ties with Britain. Abraham Woodhull (alias Samuel Culper), a farmer and Patriot spy on British-controlled Long Island, wrote Maj. Benjamin Tallmadge (alias John Bolton) a letter from Setauket, N.Y., on August 16, 1780 that is in the Papers of George Washington at the Library of Congress (hereafter denoted by the MARC Code DLC:GW). Although the editors at The Papers of George Washington do not know precisely when George Washington received that letter, we can make a reasoned guess. Judith Ridner opens The Scots Irish of Pennsylvania: A Varied People by asking, "Who are the Scots Irish?" Ridner suggests that popular and scholarly answers to this deceptively simple question tend to fall into one of two categories. One response conjures a mythic image of the Scots Irish as a "desperately poor" community that rose from "rags to riches" in America through hard work, individualism, and pragmatism. The other offers a more pejorative image of the Scots Irish as "hillbillies" living in abject poverty. In classic historian form, Ridner suggests that the answer is far more complex than either conventional answer. Ridner's begins her book with an important discussion of terminology. In eighteenth-century Pennsylvania, the label "Scotch Irish" carried class connotations, and Scots Irish of middling and lower status using it to distinguish themselves from neighboring Germans, Scots, and Irish. More privileged Scots Irish preferred the terms "Irish" or "Irish Presbyterian," which highlighted their links to Ireland and their religious identity as dissenting Protestants. To avoid the derogatory connotations of the name "Scotch Irish," scholars today prefer the labels "Scots Irish," "Ulster Irish" or "Ulster Presbyterian." As we explore the origins and early days of the role of First Lady, Jeanne reveals the history behind the term "First Lady"; Details about how Martha Washington, Abigail Adams, and Dolley Madison shaped the position; And, information about how each first First Lady organized and held her Republican Court. Benjamin Franklin's popularity with French women happened long before he was appointed Ambassador of France. When he landed on French soil in December of 1776, having set sail on 26 October as agent of a diplomatic commission, women (and probably men too) wanted to catch a glimpse of the experimenter with lightning and the defender of the American cause. When they did, they were not disappointed. Women in particular thought the 71-year-old Franklin was electrifying as they had never met anyone quite like him. He had a rustic appeal when he appeared wearing his marten fur cap, the same one that he had worn to protect himself as he crossed the freezing waters of the Atlantic. In the fashion capital of the world, Franklin stood out. He stood out even more so, when he appeared in his cap at the court of Versailles that was known for its strict court protocol. I have also read Julie Wheelwright's book, Esther: The Remarkable True Story of Esther Wheelwright: Puritan Child, Native Daughter, Mother Superior (HarperCollins, 2012). It's a very thorough and well documented research job. The book flows beautifully and is a captivating read. It was difficult to put it down at times. As a direct descendant of Esther Wheelwright, Julie had a close and endearing perspective while writing her book. She used that perspective to take readers through her very personal journey of research and discovery. Early on my in my reading of Julie's book, I was very surprised to discover I'm related to Esther through her uncle. This of course added to my fascination of Esther's life. This book offers a personal window into life in the times of early settlement in the northern states and in Quebec, settlers' relationships with native inhabitants, and the church's role and influence. I highly recommend this book. The list of UE Certificates issued since late in 2012 – showing the Loyalist ancestor, name of descendant (when permission is granted), branch and date – has been updated with the certificates issued in July and August of this year. The same updates have been applied to the Loyalist Directory. Where are Ruth Nicholson, Jean Rae Baxter, and Dale Carle? War of 1812 Veterans Grave Marker Dedication at Bowman Cemetery 1803 on Sunday, October 21, 2018 at 10:00 a.m. Please mark your calendar, and join us in honouring eight of the remarkable early residents of Ancaster ON. 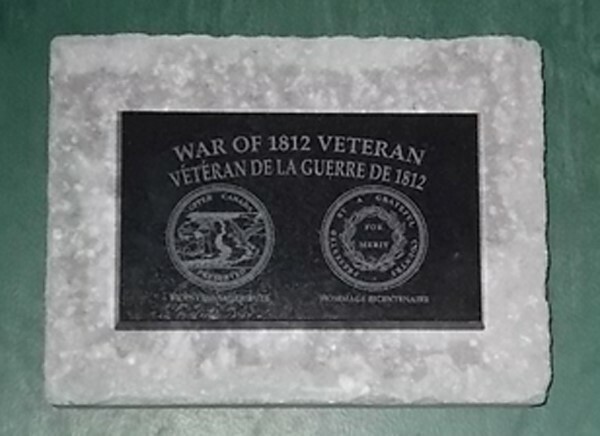 On Sunday October 21st, 2018, at 10:00 a.m., at the Bowman Cemetery, located at 880 Garner Road, Ancaster, Ontario, we will be unveiling eight War of 1812 Veteran Burial Plaques in honour of: Captain Peter Bowman, Sergeant Henry Hagle, Private Luke Hagle, Private John Kelly, Private Benjamin Smith, Private Henry Lewis Smith, Captain John Smith, Gunner Lewis B. Smith. You are indeed invited, to this historic event. Please tell your friends. Refreshments will be provided.Yours truly, Brenda Denyes U.E. & Marilyn Hardsand U.E. Another reminder that the American War for Independence was much more interesting and complex than we tend to grant it. Here, a memorial [plaque] commemorates Guy Carleton's 1775 victory over Benedict Arnold in Old Quebec as a unifying moment in Canadian History. Richard Montgomery's last address. Benedict Arnold, who lived in Chateau Ramezay when he commanded the Montreal garrison in 1776, later "re-affirmed his loyalty and to the British Crown." 28 Sep 1778 In the Baylor Massacre in River Vale NJ, American regiment slaughtered & captured by Col. Maitland. Dozens of Virginia militiamen are killed or wounded in a surprise attack as they sleep, in what is today River Vale, New Jersey. 28 Sep 1781 Battle of Yorktown begins. Combined Franco American forces (7.8K Frenchmen, 3.1K militia, & 8K Continentals) arrive within two miles of the British lines. The first cannon of the siege was fired by George Washington. 27 Sep 1779 John Jay appointed ambassador to Spain; secures $170K loan, but no formal recognition of independence. 26 Sep 1777 British occupy Philadelphia, forcing Congress to flee to Lancaster and then York, Pennsylvania. 25 Sep 1780 Benedict Arnold's treasonous plan to give West Point fort to British discovered. 24 Sep 1775 British Cabinet states they intend to "carry on the war against America with the utmost vigour." 23 Sep 1779 Captain John Paul Jones audaciously captures HMS Serapis off the coast of Yorkshire, England. Could you imagine wearing these fashions to work? Check out Dressmaking and Shoemaking demos on Sunday, October 24th as part of our Historic Trade Series! Some lovely dress from the Archive to jumpstart your weekend. English dress, c. 1820; cotton plain weave w/ metallic-thread embroidery & silk ribbons w/metallic passementerie. Box of silk brocade and embroidery fragments from St Clares Abbey, 18th c. Throughout their history the Poor Clares made vestments and embroidered them. The workrooms at St Clares Abbey continued in use until 1981, where these boxes of the smallest scraps from Rouen were kept. Measuring for mannequin fitting, Brocaded silk stays c. mid 18thc; Italian; homespun lining, leather waist tabs; piecing throughout. Photo. Am I not a man and a brother?' A Wedgwood anti-slavery plaque, 1797. Designed by William Hackwood and widely distributed by the anti slave campaigner Josiah Wedgwood and given out, not commercially sold. Rare and very poignant. Expedia names Digby NS the fourth most charming historic town in Canada. In 1783 Digby was settled by United Empire Loyalists, led by Admiral Robert Digby, the captain of the HMS Atalanta, the ship that brought them here. Citizens who came on the ship, from New York and New England, appreciated Admiral Digby's efforts in leading them to safety and they petitioned to have the land here named Digby. Digby is not the only "charming historic town" with Loyalist connections. Others in the list of nine include St. Andrews NB and Kingston ON; others may as well. Responses re Oath to ... Christianity? I have never heard about an oath to Christianity being a prerequisite for a land grant. However I do know that an oath of allegiance to the King was a requirement for land grants (specifically in New Brunswick but probably throughout British North America) Whether that oath, which I have never seen, included language which could be interpreted as an oath to Christianity, is an open question. As the King was also the Head of the Church of England, it would be quite possible that someone of another faith could view an oath to the King as a conflict with one's own religious views. I suggest looking at the publication by Sheldon J. Godfrey and Judith C. Godfrey, Search Out the Land: The Jews and the Growth of Equality in British Colonial America (Montreal & Kingston: McGill-Queen"s University Press, 1995.